09/10/2014- Thecus Technology Corp. today announces another world first: Windows Storage Server 2012 R2 Essentials is now available for NAS users. Available this October, the 2-bay W2000, 4-bay W4000, and the 5-bay W5000 offer a host of benefits to SMB users, including data protection, integrated cloud services, and secure remote access. 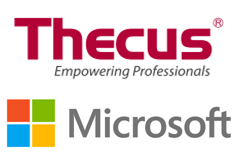 By running Windows Server software on a Thecus NAS, users will be able to simplify the integration of Microsoft's cloud-based applications and services, including Microsoft Office 365 and Microsoft Azure. These new NAS offerings provide users with an affordable, flexible solution that minimizes resources spent on business operations while still optimizing productivity.